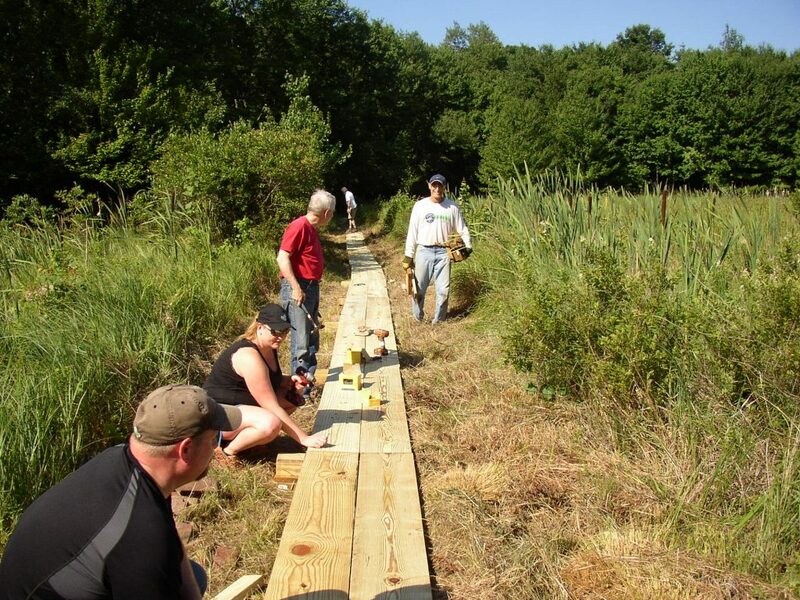 On July 23, 2016, Harwinton Land Trust members (Bob Clark, Larry Connors, Paul Edwards, Gary Griffin, Craig and Heather Henry, Bob Orciari, Eric Rahn, and Bill Tracy) installed 340 ft of boardwalk at Meadowview over two separate sections of trail. 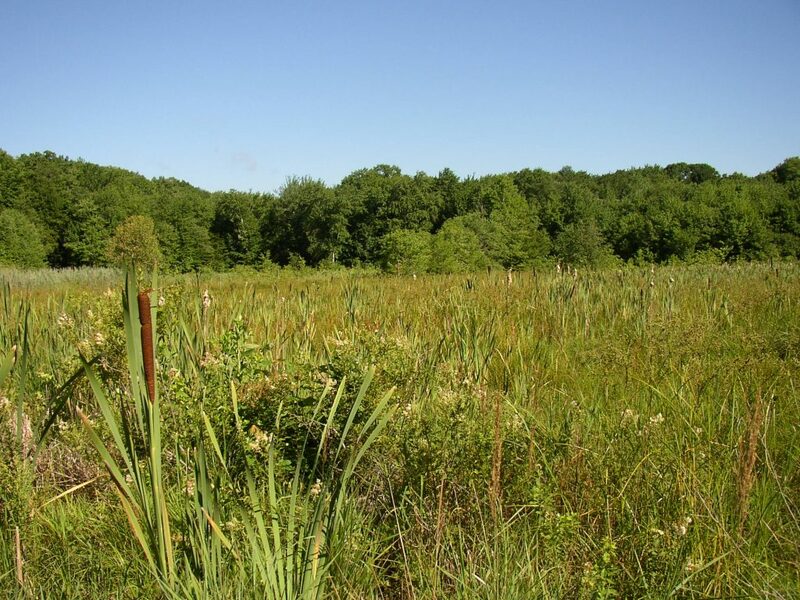 One 130 ft boardwalk spanned the tip of the south marsh and another 210 ft boardwalk was installed between the south and north marshes. Combined with close to 250 ft of boardwalk constructed along the side of the north marsh last year, Meadowview has close to 600 ft of boardwalks. The boardwalk system is now complete and will allow visitors to keep their feet dry, even during wet times of year. Meadowview’s trail loop is about ¾ mile in total length and was constructed with seniors and small kids in mind. 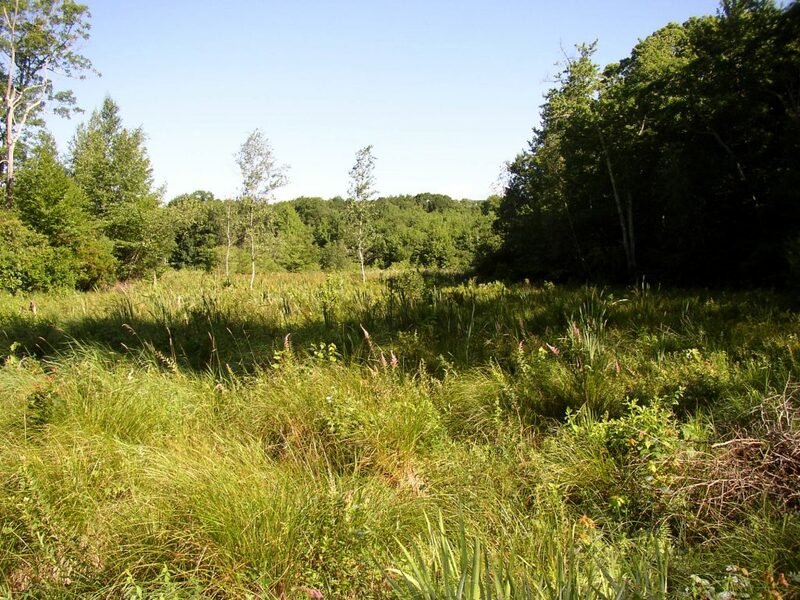 The cost of lumber was covered through a grant by the Northwest Connecticut Community Foundation. Over one hundred planks and boards had to be brought to the work sites. 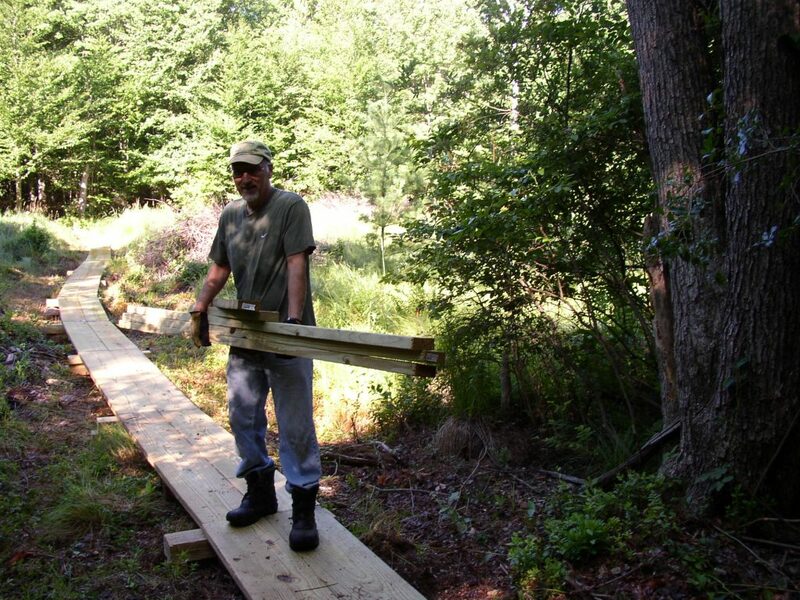 The crew working on the boardwalk that passes between the south and north marshes. 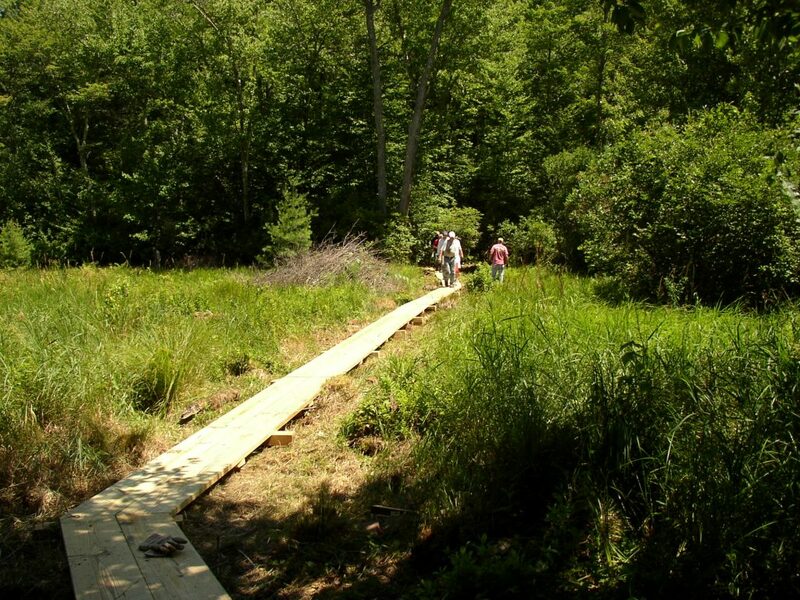 The boardwalks are level, allowing visitors to easily pass through the hummocky and soggy marshes. Visitors now have nice views of the north marsh. They can also take in the views from the tip of the south marsh. Thanks to the Ganoe family, the Land Trust has two new benches installed along the white trail of our Bull Pond Preserve. Jeff and Cheryl Ganoe of Harwinton were visited by their nine grandsons from Massachusetts and Utah. Each summer, Jeff and Cheryl turn the kids’ visit into a camp (Camp Geedapapa). It’s not all fun and games, since “camp rules” require the kids to perform some form of community service, and on July 18th they helped the Land Trust. No matter how big or small, each kid hauled a piece of equipment or lumber about a quarter mile to the bench sites. The kids dug holes for the bench legs, measured and drilled bench parts, and clipped brush to provide good views of Bull Pond from the benches. The benches came out great, and just as importantly, the kids had great fun catching frogs after their work was done. The photos below tell the whole story.